Today’s recipe comes courtesy of Wayward Chocolat, an artisan chocolate company located right here in Austin, TX. Aside from the fact it’s from Texas, Wayward Chocolat is unique in that it’s enriched with antioxidants. Ingredients in Wayward include rosehips and berries sourced from Alaska; and one piece of Wayward Chocolat is said to have as much antioxidant power as a cup of blueberries! Let’s see. Blueberries or chocolate? I’ll take both! But seriously, I’d be happy with this chocolate even without the antioxidants. It’s velvety smooth and definitely the shiniest chocolate I’ve ever seen. I had to put on sunglasses when I opened the box! Okay, not really. But it was so shiny and tempting I couldn’t resist grabbing a chocolate before I took the photo. If you are looking for a unique chocolate to give as a gift or are building a Texas themed gift basket and want something a little more interesting than the usual jerky, salsa and chili powder, Wayward Chocolat is perfect. 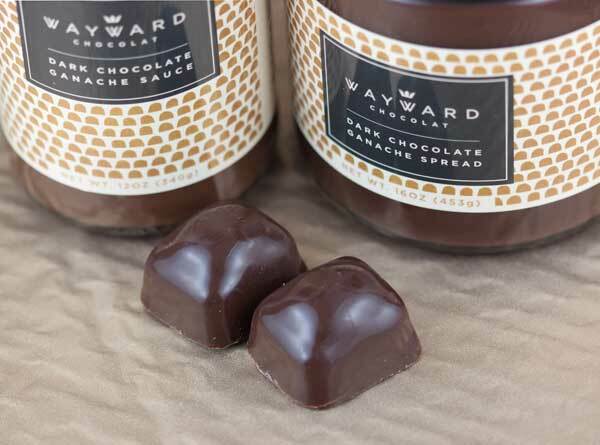 Of if you don’t want to give actual chocolate, consider a jar of Wayward’s ganache. It’s what’s drizzled over the brownies in the photos, and it really is a ganache as opposed to just chocolate sauce. 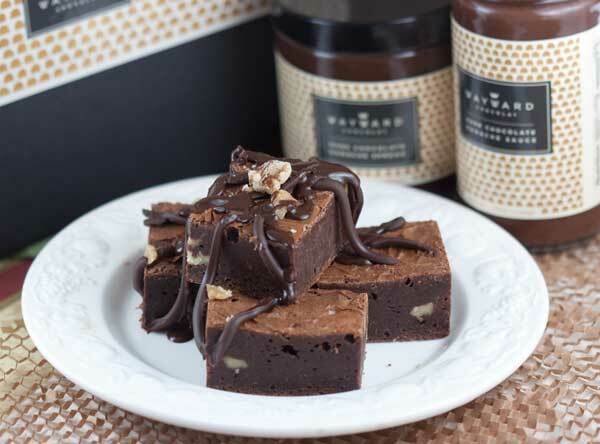 Here’s a link to the recipe for Wayward Chocolat chocolate brownies recipe.The brownies themselves are not made with Wayward Chocolat so you can use any good chocolate in the recipe itself, but they are so good when topped with Wayward’s ganache. 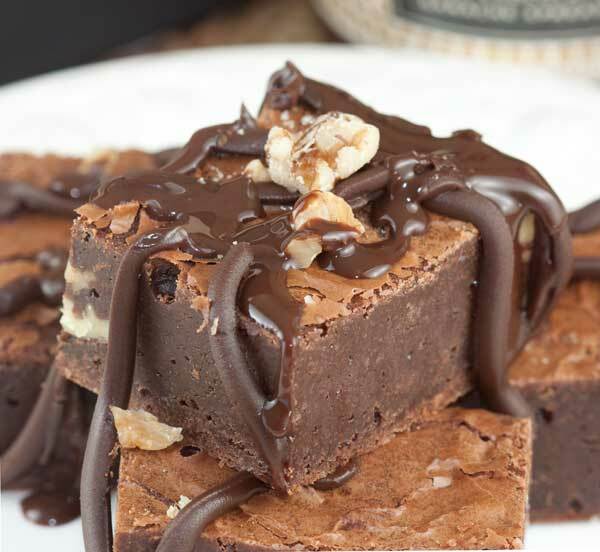 Those brownies look almost like fudge! So delicious. 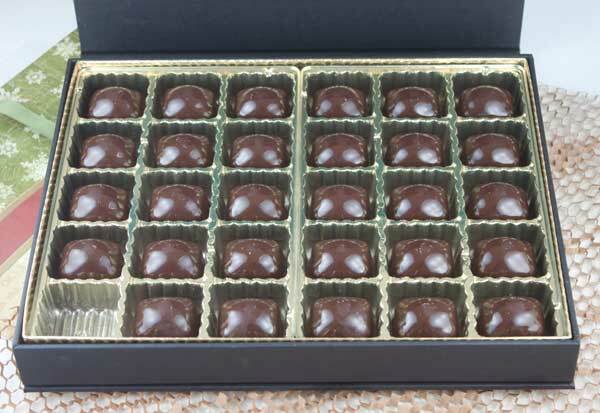 Darn, those chocolates look awesome! I must check them out. Antioxidants = healthy, right? !